BRACKNELL, UK. 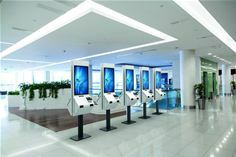 19th FEBRUARY 2018: Panasonic today announced that it will offer Pyramid Computer GmbH’s leading polytouch® 32 passport interactive touch screen kiosks as part of its range of solutions to address the challenge of the new omni-channel retail era. Pyramid’s fully customised solutions, including comprehensive logistical and service support, will complement Panasonic’s existing range of retail point of sale solutions and rugged tablet and handheld devices.